Visit KSFilm.org to see the full documentary. An Ancient Forest National Park is proposed for Northern California and Southern Oregon to biologically join together wilderness areas, roadless areas, a national recreation area and wild and scenic rivers into one cohesive land management unit for the protection of ancient forest plants, animals and fish. The proposal is to set aside a solid block of land 3.8 million acres from the Rogue River in Oregon to the Eel River in California. It will forever allow the free migration of species from the coast and Redwood National Park to semi arid inland canyons. The park would include already established wilderness areas and already designated critical wildlife areas along with about 1 million acres of unprotected inventoried roadless areas. Very little of the acres included are private land and most of it is very steep and uninhabited. Vast as it may seem, during the Clinton presidency, two national monuments were designated of similar size and scope, one in Arizona and one in Utah. The area proposed as Ancient Forest National Park is vast, but for the survival of species in this era of climate change and major fires, it needs to be. There has to be room for the constant change in habitat types that comes with what is truly wild. The Kalmiopsis area was burned almost in its entirety in one summer season and much of the Trinity Alps forests burned in two summer events, and the Marble Mountain Wilderness was half burned the summer of 2008 along with the Ukonom Creek and Dillon Creek Roadless areas. There is no time to waste because climate change is happening right now and animals and plants and fish in this ancient forest are stressed. In fact, outside of the park proposal, much of what was here when white-man came to the West is now gone for good. The Ancient Forest National Park would include the most rugged and scenic remnant of what was a coast to coast wilderness not long ago. The reason this area has survived in tact is because people have fought and fought again for its preservation. A major part of the landscape proposed as Ancient Forest National Park has been set aside in a piecemeal fashion with no thought given to species migration. It’s time to join all those pieces together now. 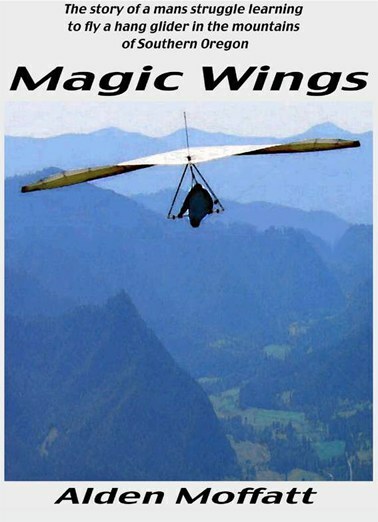 The story of one man’s struggle learning to fly a hang glider in the mountains of southern Oregon. “A spending analysis released by Michigan State University says direct spending by visitors to national parks generated $12 billion in 2010. The spending spurred related enterprises around the parks, which contributed a total of $31 billion to local economies, according to the study by professor Daniel J. Stynes.